A growing number of Sanders supporters believe that Bernie's key to winning Western States with more than 60% of the vote is to have his campaign immediately shift millions from planned media buys and use the money to fund grassroots efforts. As the Democratic candidate whose poll numbers beat Trump by double Hillary's lead, Sanders' best hope is now a superdelegate switchover in a contested Convention. This can only happen if he wins big in California, Oregon and New Mexico. To do this, and to make sure that the suspicious voter roll purges, party affiliation switches, and voting machine "irregularities" of recent Democratic primaries do not infect the upcoming West Coast contests, the Sanders campaign is going to need to shift its spending strategy from big media to paying field organizers on the ground. It is surprising that Sanders, the most successful national grassroots leader in generations, supports grassroots issues, receives his funding from the grassroots, but has a campaign that has chosen to inadequately fund its grassroots field work, while spending the largest portion of its budget on corporate media buys. A recent analysis of Sanders vs. Clinton's first quarter 2016 spending found that Sanders has spent far more than Clinton on media buys, and far less on payroll. A comparison of FEC spending reports for April 2016 finds the same trend has continued, with Bernie spending nearly $20 million on media buys, while Hillary spent about $13 million. During the same time, Sanders spent under $3 million on payroll costs, while Clinton spent more than $4.3 million. Charles Chamberlain, Executive Director of Democracy for America, which is supporting the Sanders Campaign with grassroots volunteers, recently told me that his organization does not do media buys. "We always believe that money is better spent on field organizing than on TV ads," he explained. "We see media buys as the icing on the cake." The Sanders revolution is a populist cake that, as I reported here last month, benefits from an evolutionary, social network driven element of free, "People-powered media," that takes Bernie's messages, videos, and supporter created memes, and shares them hundreds of millions of times. Although nobody suggests that mainstream media buys are unnecessary, given Clinton's greater name recognition and a corporate news media with a strong bias in her favor, the big question being raised this week is whether some of this airtime needs to be immediately diverted to door knocking time. Last week David Karabelnikoff, an Aleut Alaska Native who has worked months of long hours volunteering for the Sanders campaign in Nevada, Alaska, and California, met with me to express the worry of many field organizers on the West Coast that Bernie is losing the primary "ground game" to Hillary. Karabelnikoff has since launched this new petition calling on Bernie Sanders to "divert millions of dollars from media buys to pay for free campaign materials and local field organizers reflective of the ethnicity of our diverse communities." He writes, "We need the tools to mobilize an army of supporters to spread the word of the revolution, while helping voters ensure that they have not been purged from voter roles or had their party affiliations mysteriously switched." There has been a conventional logic to the outsized preference that the chief strategist of the Sanders campaign, veteran Democratic consultant Tad Devine, has given to corporate media buys (for which he receives millions in commissions), over expenses like payroll, lawn signs and bumper stickers (for which he does not receive commissions). The logic of the campaign's highly paid experts seems to be that since his supporters love Bernie so much, there are plenty of passionate workers who are willing to work for free. Why pay them, or pay for campaign materials that donors may order, when you don't have to? The reason, argues Karabelnikoff and others with their ears to the grassroots ground, is this: "Bernie 2016 needs to match Clinton's ground game, which is paying people of color living wages for door-to-door outreach in Oakland and other cities. At this time, Bernie's campaign professionals are refusing to hire more than a skeleton crew of canvassers with scarce resources, while reserving nearly all funds raised for big advertising buys from the corporate media. This is not the way we are going to win this. If we rely solely on volunteers for outreach, then only those who can afford to work for free, often meaning, the well to do and retirees, are able to assist. This greatly limits the diversity of those who represent Bernie." Shimeko Franklin, a woman of color who was recently elected to be a California Sanders delegate, agreed. "Being a district-level delegate for Bernie Sanders I will have a hand in informing the democratic platform in a way that will change my community directly. However, if grassroots organizations are not supported in outreach in the communities they have already been nurturing this will be serious loss of opportunity both for voices like mine that are in full support of Bernie Sanders and for people that will be affected most by his platform." Californian Lori Grace, Founder of the Institute for American Democracy and Election Integrity and a Sanders donor, urges the Sanders campaign to "please hire some African-American and Latino people to canvass on behalf of Bernie Sanders in low-income neighborhoods. You will lose California unless you do that. People like to see a canvasser who looks like them when they open the door. Please be consistent with the ideals Bernie professes and help low income people of color canvass so that Bernie might win California." Grace believes that a small army of Sanders staffers and supporters need to go door to door to help voters check their online registrations to make sure they are registered Democrats prior to a May 23 California registration deadline, and to prevent the kind of election fraud, purges, and suspicious party affiliation changes that she believes happened in states like New York and Illinois. She urges citizens to protect their votes by printing out their online registrations that shows them registered as Democrats, and bringing these printouts into the polling place with them. If, on Election Day, voters find they are not permitted to vote, she urges them to not immediately accept provisional ballots, but to peacefully insist on their right to vote, and ask to speak to the County elections monitor in their local polling place. If that odes not work, Grace suggests calling for campaign help, as well as recording one's own peaceful interaction at the polling place, which is legal and could be helpful, as long as it is non-disruptive and does not intrude on the privacy of other voters. Stephen Jaffe, a San Francisco attorney who assisted the Sanders campaign with polling irregularities following the disputed Nevada caucus primary, agrees with Grace that accepting a provisional ballot, which often remain uncounted, is a form of voter disempowerment. He is part of a new activist organization that is being set up across California to staff a call center to assist with voter complaints on June 7 in California. 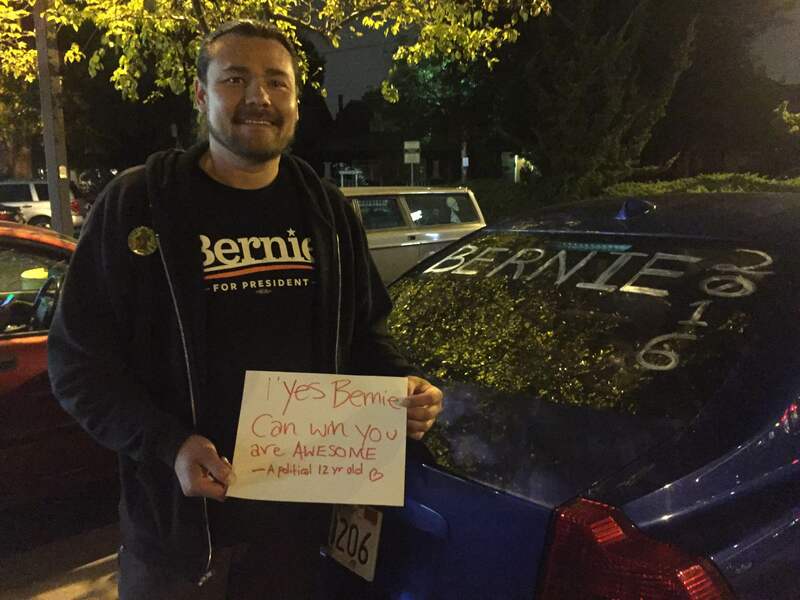 Gerardo Omar Marin, a youth organizer and Bernie campaigner based in Oakland offered this plea to Bernie Sanders. "Dear beloved Bernie Sanders campaign community: Indigenous/Chicano communities have been volunteering for your campaign but our skills and networks are not being properly utilized...You have invested resources into your media strategy which feels important AND we urge you to invest in on-the ground canvassing, presentations, and outreach led by communities of color, in this case-Indigenous/Latino to mobilize the migrant vote. Many of us are ready to volunteer and at the same time we strongly encourage you to raise and dedicate resources to compensate outreach workers so that they can leave their work and give more of their energy to the campaign." A pivotal moment is at hand, perhaps the last opportunity Bernie's revolution has to win the nomination. Will Bernie Sanders, and his campaign team, heed this grassroots call?